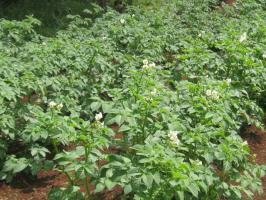 Potato Seed Production | Infonet Biovision Home. Second only to maize, "Irish" potatoes play a very big role in the Kenya food security situation. Potatoes can be grown within a growing period of 3 months, produce good yields of highly nutritious food and be stored for some months under the right conditions. However growing potatoes in mixed cropping systems as currently practised by many small scale farmers where volunteers from previous crops are not weeded out has by now managed to spread serious seed borne plant diseases to most potato growing areas. This has resulted in declining yields and again undermined the possibility of good food security in These areas. Farmers can also grow their own seed and share with neighbours, if good field hygiene is observed as described in this article. 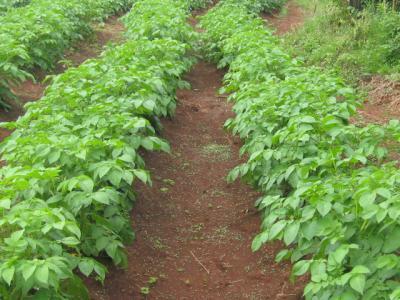 In Kenya there is a very large commercial opportunity in the production of certified seed potatoes. The demand for and commercial price of clean potato seed tubers is far higher than potatoes for the food market. Mid 2010 it was established that Kenya only produces about 1% of the potato seeds needed every year by potato Farmers countrywide. 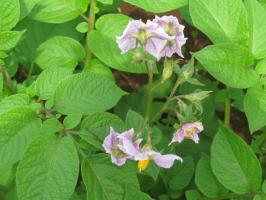 Clean seed is the best start for a good potato crop yield as most potato farmers know or have discovered. 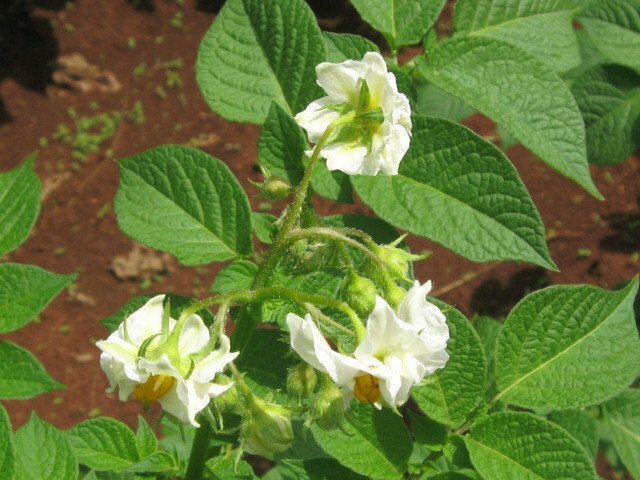 So if you have an extra piece of land free of bacterial wilt and other potato plant diseases, it might be a very good ideal to pay a visit to KEPHIS (Kenya Plant Health Inspectorate Service ) and find out from them how to go about such a venture. The production of certified seeds can easly be carried out in farmers fields, but will need inspection and certification by KEPHIS officers to be able to attract the nice high price tag that currently is offered for such clean seed. It should not have had any Irish potatoes, capsicums, eggplants (brinjals) and tomatoes grown in it for the last 5 years. Preferably it should have had a dense mat of grass growing on it for at least one year during the last 5 years. Other probable sites for seed plots include virgin land and land that has been under fallow for 2-3 seasons. The plot should be located in full sunshine in highland areas, and in half shade (for example shaded half the day) in hotter areas. The seed plot should not be situated in low-lying or water-logged areas where run-off water flows into it. There should be a good supply of well composted farm yard manure applied just before planting the certified seed potato tubers. If the amount of manure is not very much, it should be applied in the trenches dug for planting tubers. If Lantana camara bushes grow in your neighbourhood it is very beneficial to also mix in leaves of lantana in the potato planting rows to repel insects. This is a procedure where any diseased plant particularly infected with bacterial wilt or viruses is removed from the field immediately it is noticed and the remaining healthy-looking plants at flowering are marked with sticks or pegs. The marked or selected healthy-looking plants should be checked weekly and those which have developed disease symptoms should be un pegged and removed from the field. Pegged plants should not be near (at least 1 metre away) where diseased plants were removed. These pegged plants are considered to be positively selected seed potatoes. 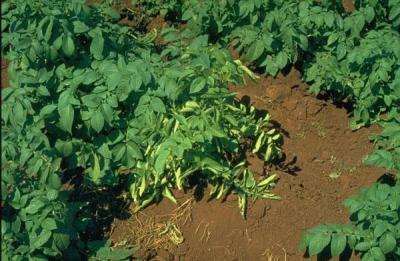 The removed diseased plants with bacterial wilt including their tubers should be put in a 1-metre deep pit and covered with clean soil or be burnt. Also wilt infected plants and tubers should not be put in compost heap. A healthy plant is vigorous, has many stems, dark-green leaves and at harvest, has more seed-sized of 35-55 mm than smaller ones below 25 mm in diameter. 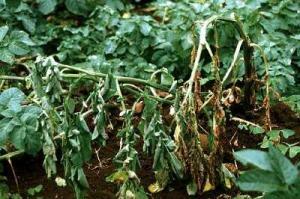 Bacterial wilt symptoms on potato plants. The first visible symptom on foliage is a wilting of the leaves at the ends of the branches during the heat of the day with recovery at night. As the disease develops, a streaky brown discolouration of the stem may be observed on stems 2.5 cm or more above the soil line, and the leaves develop a bronze tint. Mark out beds of 2.0 m width and a sufficient length depending on your seed needs. Plant in furrows at a spacing of 30 x 30 cm at planting depth of 15 cm. A 90 m2 seed plot (2 x 45 m) can provide enough material to plant 0.4 ha (1 acre) of ware potatoes (4000 m2). Hand weeding is recommended. 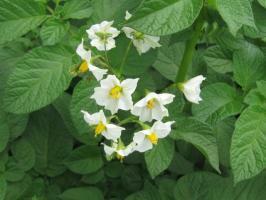 Weeding should be done on appearance of weeds until there is sufficient potato growth to suppress weed growth. On maturity, when leaves begin turning yellow, remove potato vines (haulms / stems) about 2 weeks before harvesting to harden tuber skin. Harvest when the soil is dry. Avoid injuring the tubers. Seed tubers must be unbruised measuring 2.5-5.5 cm in diameter. Larger tubers should be sold off as ware potatoes. Selected seed tubers should be stored in diffused light and ample aeration. 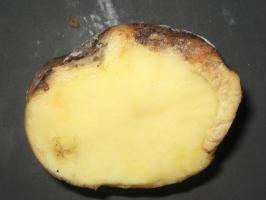 Do not store seed tubers in dark stores used for ware potatoes. Store tubers of each variety separately. Do not store seed tubers in gunny bags. Spread the seed tubers thinly on the floor or in wooden crates. Cover with branches of Lantana camara. 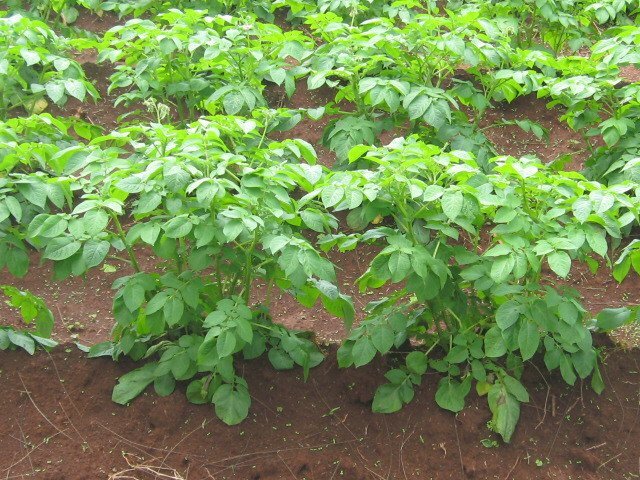 Farmers in Naivasha have discovered that storing seed potatoes under saw dust keeps away tuber moths and keep the potatoes seeds longer. 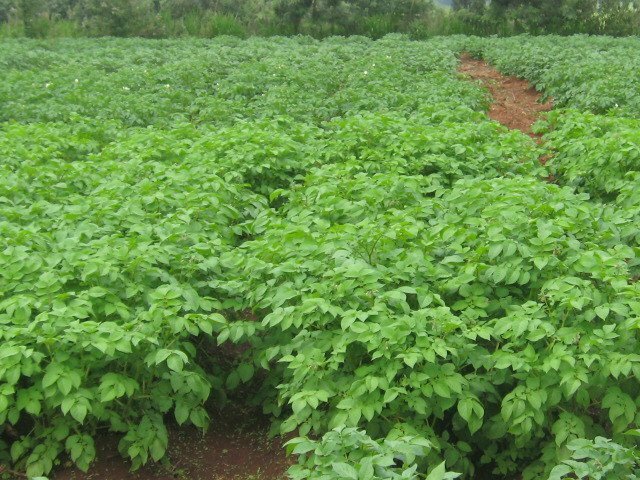 Tubers harvested from seed plots are divided into 2 lots: one lot is used to establish a new seed plot (for not more than 3 seasons) as described above and the other lot is used for production of ware potato in main fields. Fence the seed plot area to restrict movement that can cause contamination. Plant maize around the seed plot as a border crop to minimize aphid infestation. Plant at least 4 rows of maize 2-3 weeks before seed potatoes. Clean /and disinfect all tools, feet and shoes before entering the seed plot area. Use a household bleach (sodium hypchlorite) (e.g. JIK(r)) at the rate of 50 ml in 1 litre of water.